Here's another sign of progress: the Pioneer drive weighed in at 1.1kg and had a small cooling fan at the rear of the unit. By contrast, the LG GBW-H10N weighs only slightly more than a conventional LG Super Multi Drive (960g against 910g). 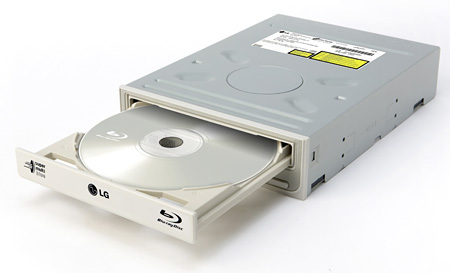 Unlike the Pioneer, the LG doesn't have a cooling fan and it does have support for the DVD-RAM format. The LG is a conventional IDE drive with analogue and digital audio connections, a jumper block, IDE connector and a four-pin Molex power plug. The IDE cable is a touch unusual as there's a ferrite band around the cable just below the Master Socket at the top. The cable is even labelled to make clear it's the connection for your new drive. Not following the subsequent update instructions explicitly will result in permanent damage to your drive, for which LG will not be responsible. Connect the drive as Master by itself, on the secondary IDE controller with no other device on the same IDE cable, making note to set the jumper on the back of the drive to the Master position. Ordinarily we have a cavalier approach to this sort of thing but would you play chicken with a £459 piece of hardware? No, neither would we. It's therefore a little surprising that LG hasn't minimised the risk by supplying an IDE cable with just two connection points and a jumper block that's fixed to Master.